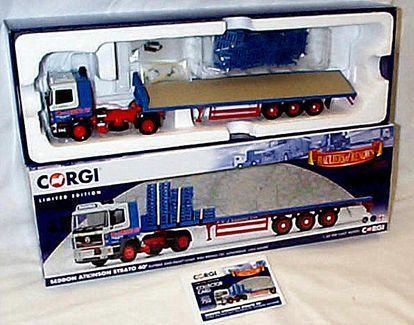 Over the years Corgi have released several models of W & J Riding vehicles which included the makes of Bedford, Atkinson and Seddon Atkinson Strato. All the models below are readily available mainly on the internet auction site Ebay. Based on Riding's 'S' Type Bedford Reg No VTB 954 which was bought off Leyland Motors in 1955. It was the vehicle used by Leyland for the original fitment of a Comet 90 engine into a Bedford which Riding's bought after Leyland did all the testing of the conversion. This model was based on Atkinson Borderer 4x2 tractor unit Reg No HTC 320K Fleet No 9 'Steady' which joined the fleet brand new on the 1st of September 1971 at a cost of £4,802. Powered by a Gardner 180 engine in line with a David Brown gearbox it was just one of many Atkinson Borderer's Riding's operated throughout the 1970's. 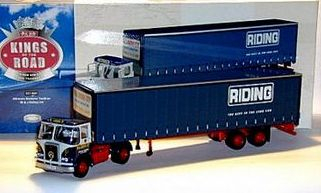 Released in 2012 this particular model was based on the first brand new Seddon Atkinson Strato 4x2 tractor unit to enter service with Riding's on the 1st of May 1989. Reg No F500 BFV Fleet No 24 'Invincible' when new cost £30.027.65p + vat, slightly more than the recommended price of £88.99 for the Corgi model. A close up out of the box shot showing the fine detail of Seddon Atkinson Strato Reg No F500 BFP.